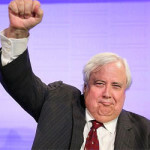 Word out of Australia is that Clive Palmer, the billionaire who announced plans to build a sailing replica of the Titanic, has run into financial straits. It’s not directly related to the ship building effort. Rather, he is being sued for $66 million Aus in entitlements for workers fired from his Queensland Nickel refinery. He is now involved in court proceedings. He has stated that he has had nothing to do with the plant. He has said the managing director, Clive Mensink, should be the one involved. Under his control, the company went bankrupt and then liquidation. Creditors were owed $300 Million Aus. So the good ship Titanic 2 may not happen. We’ve followed this effort from the beginning. Get up to speed by checking out past blogs. Also, read about the Chinese project to also build one. The design was water tested in Germany and Parker’s plan was initially to sail it from England to New York, but that plan changed to being berthed in Saudi Arabia. The break-keel date has slipped continuously. It was to be identical to the original, save for modern underpinnings…..and radars to look for icebergs! Tickets would be sold as in 1915 – First class, second class and steerage. Those down below would have to share restrooms. Compounding the drama, he has told reporters that he is suffering from pancreatitis and had earlier undergone a gall bladder operation. My bet is that it won’t happen. Cuba is next on my list. Subscribe to keep up to date on news about our industry. Take our class and begin sailing for free. Give talks and you go for free. Note: there will be an agency fee upon booking. We are not an agency, but help you through the process to get you on. It’s a maze, but we figured it out in over 10 years of sailing. Talk to us – it’s a good deal….but YOU decide.